Louise Allen (1875-1953) was born in Lowell, Massachusetts and spent almost all of her life in and near Boston. She studied at the Rhode Island School of Design and the Boston Museum of Fine Arts. 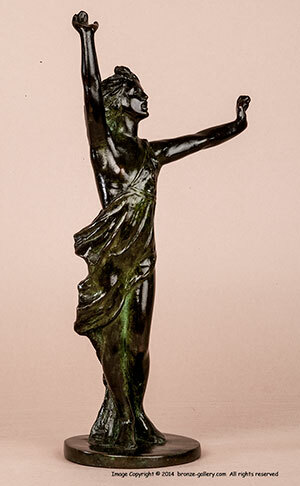 She was a member of the Copley Society of Boston and the National Sculpture Society and exhibited at the National Academy of Design, the Art Institute of Chicago in 1916, the PA Academy of Fine Arts in 1918, the National Sculpture Society, and others. Most of her works are of figures and garden sculptures, and a few small animals. This fine bronze shows a slim young Girl as she raises her arms and gracefully sways as if dancing to soft music. She is wearing a loose garment which shows her lithe form and flows with her movements. This model dates from 1914 and it is her best known work. The Girl was cast in several sizes, and a 27 inch example is in the Cleveland Museum of Fine Art, Ohio with the title of "Pippa Passes". Our bronze has a rich dark green and brown patina, and was cast in 1914 by the Ideal Castings foundry in Providence, Rhode Island. She was also cast by Gorham Foundries. 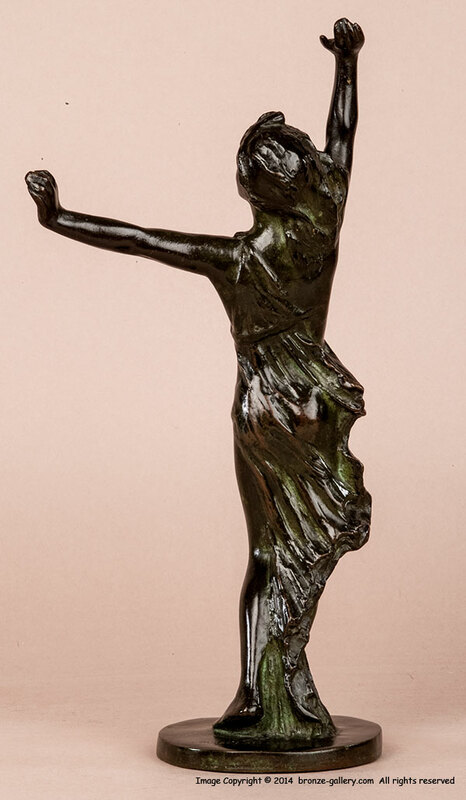 A wonderful bronze of a young Girl Dancing by a fine American sculptress. We also have a 27 inch tall Girl cast by Gorham, please inquire.